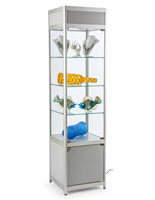 Museum Display Cabinets Ship Quickly From Our Stocked Warehouse! 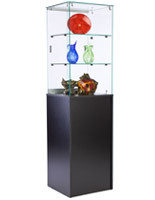 Unlike Wall Curio Cabinets or Display Cases These Glass Showcases Stand on Their Own and Command Attention! 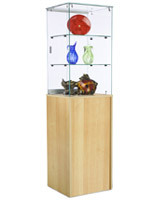 These Are Affordable Museum Display Cabinets! 6mm Tempered glass creates a safer display! Frameless design offers a 360° view within towers! Museum display cabinets showcase items in style! 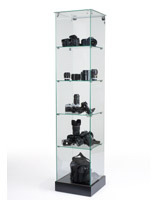 These glass cabinets draw attention to your most prized and sought-after merchandise. Museum display cabinets, also known as store fixtures, hold jewelry, artwork, electronics, sports memorabilia, glassware, handbags & souvenirs! Retail stores, gift shops, boutiques, jewelry stores, and museums are all common places to find these showcases. The museum display cabinets are useful in business or theater lobbies, holding trinkets and collectors items. A Hall of Fame, hospitals, universities and other types of schools can also benefit from the use of these glass cases. Constructed from glass & melamine, this is an attractive, sturdy case. The store fixtures can be situated against a wall, or in the center of a room, whatever your spatial limitations warrant. 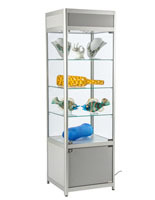 Showcase cabinets, museum display cabinets feature a sturdy, resilient, tempered glass construction, creating a virtually unbreakable case. If the product does happen to break, it will shatter into small, manageable pieces, rather than large, dangerous shards. A rear cabinet turns these museum display cabinets into storage cases, as well. Store excess inventory, cleaning supplies & more! 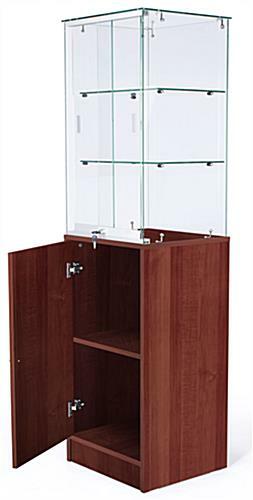 Museum display cabinets have a beautiful, cherry melamine finish, to coordinate with any décor. Two sliding, locking doors provide access to authorized individuals only. Top area height is 33-1/2", and features two fixed-height, removable shelves. This case is sent knocked down, to save on shipping costs.